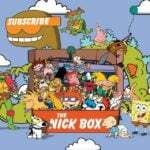 The Nick Box Fall 2018 Box Art Spoiler! The Nick Box Summer 2018 Spoiler #2 +3! The Nick Box Summer 2018 Spoiler #1! The Nick Box Spring 2018 FULL SPOILERS! The Nick Box Spring 2018 SPOILER #2!